Sahaja Yogis, of Gujarat, Rajasthan and Maharashtra, on behalf of the National Trust are delighted to inform you that by the Grace and Blessings of our Beloved and Divine Mother, a three days programme of National Sahaja Yoga Seminar & Christmas Puja is being held at SahasraraDham, Nargol, from 23rd to 25th December 2018. Our Beloved Mother has said Sahaja yogis are the followers of Christ, they are the Gnostics as described, and they are the ones who know how to help people to emancipate. Therefore, Sahaji Brothers and Sisters, let us meet at Nargol to celebrate this great Puja at the site where Shri Mataji opened the universal Sahasrara Chakra which, by the Grace of our Divine Mother, will eventually emancipate the whole world. On behalf of National Trust, you are invited to share the joy and bliss of divine vibrations on this Holy land during the International Christmas Puja 2018 at Sahasrara Dham, Nargol. 3. All Sahaja Yogis/Yoginis are requested to kindly send their Seminar Amount before 15th December 2018 so that proper arrangements can be made at Seminar and Puja site. Nargol is well connected through Road, Railway and Air, it is situated at seashore. 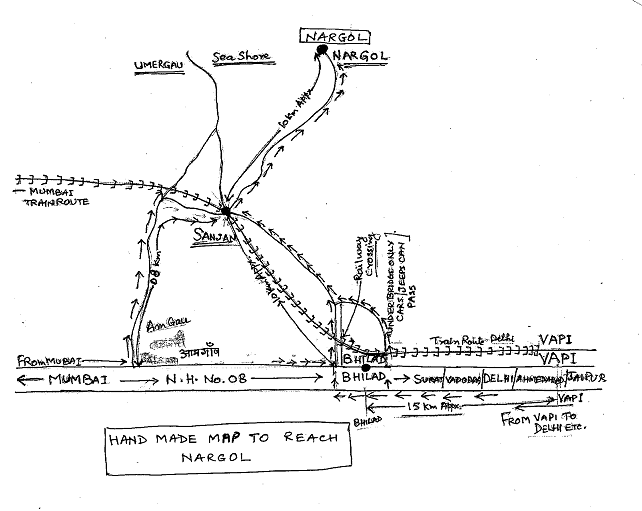 Nargol is only 170 Kms from Mumbai, 150 Kms from Surat, 280 Kms from Baroda, 400 Kms from Ahmedabad,35 Km from Vapi, 20 km from Bhilad which is situated on NH 8 which goes from Mumbai to Delhi [As per attached handmade map]. From this village, we have to go to Nargol on State highway. When coming from Mumbai Bhilad comes first then Vapi, Surat etc. Puja site: Sahasrar Dham, Nargol. To &Fro Train Time Tables are attached herewith for the trains uptoVapi/ Bhilad&Sanjan from Mumbai /Delhi/ Ahmedabad etc. From Vapi/ Bhilad&Sanjan everybody can get Bus/Taxi/Auto etc. A Bus can be arranged on prior intimation if the persons are insufficient nos. for a bus on chargeable basis. Nargol is situated on the sea beach. It is 20 km. from Bhilad, Bhilad is situated on N.H. no 8 (Mumbai To Delhi). If you come from Mumbai Bhilad comes first then Vapi, and if you come from Surat / Vadodara/ Ahmedabad/ Delhi etc. It comes after Vapi.